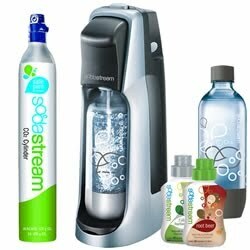 Soda Stream: How much soda pop do you drink a day? In the last year or so my hubby’s soda pop consumption has increased dramatically. At first I didn’t realize just how much he was drinking. When I found out he was going to our small town gas station every morning, and drinking at least 52 oz. just while he was there, I became concerned. Especially for his health but when you start adding up the money he spends it’s an item you actually have to budget for each month. I tried buying can soda as well as the 2 liter bottles but he rather prefers the fountain soda. How does SodaStream nutrition stack up against national brands? My general practitioner once told me that 80% of people in the U.S. are either dehydrated or borderline dehydrated. Primarily from drinking so much soda pop and coffee. We become tired with fatigue and begin consuming more soda pop and coffee. Which in turn de-hydrates us. It’s a vicious circle. Even though one of my New Year’s goals is to drink at least 70 oz. of water a day, I know I’m guilty of my coffee addiction (and sometimes Mt. Dew). Whether we win the SodaStream or not I truly hope it becomes the new trend in our country saving people both money and bone structure. I’m crossing my fingers, toes, legs, eyes and all in hopes that by some chance win the contest. I would love to give this a try to help my husband cut down his gas station soda pop addiction!! Stop by The Freebie Junkie to read more and enter her contest! While you are there check out all of the other awesome freebies or nearly freebies. Thank you to Angie of The Freebie Junkie for providing us all with great offers and freebies! !